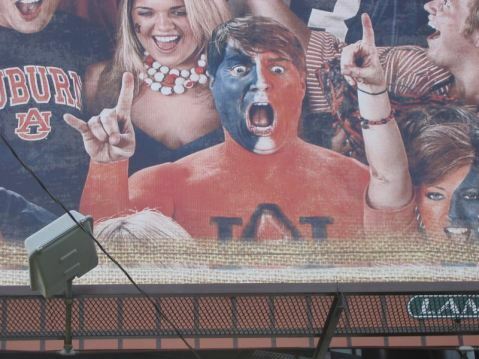 Remember that billboard with the dude who looked just like Will Muschamp that showed up on S. College right before he bolted for Texas? Yeah, that was weird. John and Van sincerely hope that the Auburn Family is not expecting a witty, joke-filled dissertation from this week’s column because, honestly, we’re just not in the mood for that right now. It seems the Hog Hex was back and in full effect last weekend (if only Otis Mounds had been there). The Tigers were able to hang with their opponents from the Natural State for about a half, but ultimately there was just too much passing from Arkansas and not enough from Auburn. The game plan Gus Malzahn put together definitely got the Tigers’ running game going again, at least initially. Unfortunately, with absolutely no passing game to complement it (for whatever reason you’d care to give), it could not become fully effective. Once the Hogs determined to simply shut down the run as best they could, and with Trotter and Frazier demonstrating that the pass was not really a viable weapon, the game plan collapsed. It didn’t help that Auburn continuously shot itself in the foot with drive-hobbling penalties. “IF” is the cruelest word. If Blake and Reed had been healthy, would Trotter have looked better and played better? Probably. If the offense had avoided the (often dubious) holding calls and the like, could they have sustained drives and scored—and kept Tyler Wilson and company on the bench? Maybe. If the defense had been able to contain Arkansas and prevent the long run in the third quarter—the Tigers were only a single score down at that point—could they have fought back and taken the lead? Perhaps. Winning on the road in the SEC is amazingly difficult. Winning on the road in the SEC West against a team that is much better than you on offense is almost impossible. Remember—last season, the Hogs rang up a (better) Auburn defense for 43 points. It only so happened that the Tigers hung 65 on them in return. That was not a realistic possibility this year. Do you appreciate Cam Newton even more now? The Kiehl Frazier era is coming—but it’s not here yet. He is clearly helping the team now with his running ability, but is not ready to be the every down quarterback just yet. Auburn’s quarterback rotation is helping; it’s opening things up for McCalebb and getting more first downs, but Frazier is not quite ready to exploit the defenses creeping up to stop the running game. And if he isn’t ready then does Auburn play Trotter again Saturday? Do they go to Option #3 and give Mr. Moseley a shot? (Moseley coming in on the very last play was like a soccer team subbing in a fresh player in the waning moments of injury time.) If the competition was as close in the fall as we were all led to believe, then maybe it’s worth a try. Or at the least Gus could give Trotter a short leash and have Mosley ready to go. The Auburn defense, which could not be counted on to slow down a troop of Brownies early in the season, has suddenly become respectable. Tackling and coverage have both improved. That may seem strange to say after they yielded 38 points to Arkansas (including that one really, really long run), but only Alabama held the Hogs to fewer yards this season. (And of course Auburn has a grand tradition of giving up horrifyingly long scoring runs to Arkansas.) Eltoro Freeman stepped in for the injured Jake Holland and made some plays. Chris Davis returned and looked okay. Daren Bates had one of his best games (if not his best). Arkansas enjoyed success with short passing routes that tore into the Auburn zone coverage, but despite that (and Wilson’s ridiculous pass-completion streak), the Tigers kept the game manageable. If the offense could only have cranked out a few more first downs in the second half, the outcome could have been very different. In short, things appear to be looking up on D.
That sickening, wet, sloshy, grinding noise you hear is the sound of a very wounded gator inching its way up from Gainesville toward the Loveliest Village. The occasional “boom” mixed in would be emanating from its emotional coach, former Auburn and Texas defensive coordinator Will Muschamp, as he prepares to face the Auburn and Texas defensive coordinator he followed. The Gators have just endured the most terrible one-two punch the SEC can currently offer: Alabama followed by LSU. Now their survivors stumble (on those little stubby reptile legs) into Jordan-Hare. So—what do we make of this? First of all, this is shaping up to be an Auburn-Florida game unlike any in recent memory. When was the last time these teams faced one another with neither of them highly-ranked or poised to play a major factor in the overall SEC and National Championship race? To find the last time neither was ranked, we have to go back as far as… 1981? Good heavens! And when was the last time they squared off with Auburn the ranked team and Florida unranked? Our research says 1988, when the Tigers shut out Florida in the Swamp during their “Gator Growl” homecoming weekend. Even the 1989 matchup, with the Gators destined to finish 7-5, saw them ranked #19 when they visited Jordan-Hare. This year’s Florida is a wounded and beaten-down team. All indications are that the third string quarterback will get the call, as he did against LSU. Due to attrition, Florida has had to revert from Charlie Weiss’s pro-style offense to more of what we saw from the Gators last year—which might be described as “post-Mullen, post-Tebow, makeshift Urban Meyer offense,” which is really just fancy-speak for a lot of handoffs to Demps and Rainey. In short, this game looks to feature two very incomplete teams facing off against one another. Can Florida completely take away Auburn’s passing game and still control the run? Can Auburn deny the Gators’ two speedsters the big plays they thrive upon? Can the Gators get up psychologically for this contest after the epic beatdowns they’ve suffered the past two weeks? We think this contest will unfold in the style of the South Carolina game—and that’s the kind of game Auburn can win right now. In Florida we have an opponent who is solid on defense but limited offensively. Auburn can line and focus on stopping the run and dare QB Jacob Brissett (or whomever else Muschamp and Weiss send out there) to try and beat them. Florida is 11th in the SEC in turnover margin and leads the SEC in penalties. Auburn needs to stop the run and, if all goes well, the Gators should chip in and help beat themselves. Auburn needs to jump on the Gators early. Muschamp’s plan likely will be to play good defense and hang around and then try and steal the game in the second half. Florida has given up a lot of rushing yards the last two weeks and that works well for what Auburn can do right now. The Tigers should come out and establish the run and then use the rest of the game to try and work out some of the kinks in the passing game (assuming that is at all fixable without Blake and Reed). This is a winnable game, Auburn—and one that could work wonders all across the board. A victory over Florida would be great for the players’ confidence on both sides of the ball. It would give the Tigers a nice home win over an old and respected foe and keep our win streak against Florida alive. (That streak stretches back to the 2001 Damon Duval field goal in the final seconds, as the rain swept in). It would be another check mark in the “win” column as we look ahead to bowl season. In the 21st Century, Auburn has beaten (and swept) Gator coaches Spurrier and Meyer. The only game the Tigers lost to Florida this century was in 2002, to Ron Zook. Ron freaking Zook. Let’s not add Boom to that list, huh? The fact that Jarrett Lee—a guy who probably wouldn’t even be starting for his team, but for a bar fight—is fourth in the league… Well, that really says it all. The Arkansas game notwithstanding, Trotter has actually been better than most of the mooks below him on this list. Which, come to think of it, also says it all about QB play in the SEC this year. 6. Conner Shaw, South Carolina. We can’t really rate him higher yet—he’s only started (and finished) one game, more or less. There’s obviously some upside here, though, if Spurrier doesn’t destroy his psyche first. 7. Chris Relf, Mississippi State. For about five minutes, we thought this guy really had it together this year. This is the guy Dooley will plug in, replacing injured Tyler Bray. Poor Tennessee. All they really had this year was a passing game. So of course they lose both their best receiver and their promising QB to injuries. Ouch. There are rumors we might see yet another guy at QB for Florida this weekend. Brantley was never really terrific, but he finally looked to be getting things going when the Alabama defense mangled him. 11. Zack Stoudt, Ole Miss. No, he is not Cam’s brother. Not one little bit. 2. Alabama. And the Super Bowl is coming in just a few weeks. Honestly, at this point, the BCS Game this year looks like a sort of anti-climactic affair after Alabama-LSU. Sort of like the USA national hockey team having to play Finland for the gold medal after they beat the Soviets. 4. South Carolina. Now with actual quarterback play! 7. Florida. As bad as you are, Gators, there are still only two teams ahead of you in the East. Yeesh. 9. Tennessee. Awful to lose the only two good players you had, Vols. We’re all waiting for the bamboo to start growing, Derek. 11. Ole Miss. This game no longer looked like such an iron-clad lock win for Auburn after Saturday night, given how bad the Auburn passing game looked against Arkansas. 12. Kentucky. Good lord, it’s just gotten woeful in Lexington these days. THIS JUST IN: JUSTICE IS SERVED!